The Georgia State Flag is composed of two fields - one deep blue and the other dark red. 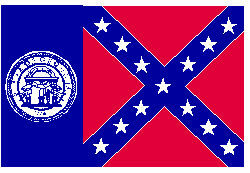 It showcases the Battle Flag of the Confederacy and the Georgia State Seal. The State Motto is: Wisdom, Justice and Moderation. Their State Song is "Georgia On My Mind", which is playing now. It is sequenced by Harry Todd and used with his gracious permission. 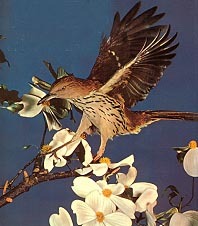 The Brown Thrasher serves as Georgia's State Bird. The delicate and lovely Cherokee Rose is Georgia's State Flower. And the noble Live Oak is the State Tree. Georgia shares its borders with Alabama, Florida, North Carolina, South Carolina and Tennessee. Are we ready to see this beautiful state? Everyone climb in the Chevy, click on the license plate, and we're off.